"Once upon a time, fairy tales were awesome." 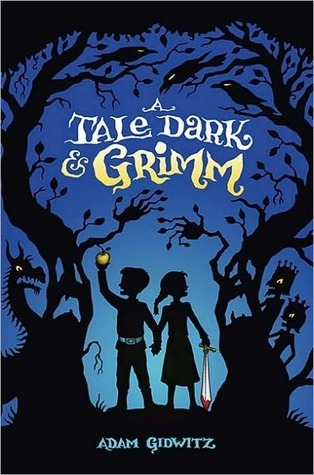 Those are the first words of Adam Gidwitz's A Tale Dark & Grimm, which is the story of Hansel and Gretel mashed up with 8 other fairy tales sprinkled with a little violence. Because Adam means "awesome" in the horrible, bloody way. Warning: This book is not for the faint-hearted. This book starts before Hansel and Gretel are born. Their father is crowned the King of Grimm, and his servant, "Faithful Johannes," describes to him all the responsibilities of being king and takes him on a tour of the castle. In the last room they visit, the king sees a portrait of a golden princess; he falls in love with her, and faints. When he wakes, he orders his servants to ready a ship. He will go to the island of the golden princess and claim her. When they arrive at the island where the princess lives, they trick her into boarding the ship, and they sail back with her. Three ravens speak of three dangers the king and princess will encounter when they docked. Johannes overhears the ravens speaking, and heroically saves the couple from the dangers. But when he explains to the king what he has done and why, he is turned to stone. The king and his new wife put the stone Johannes in their bedroom. Faithful Johannes. …and Johannes comes out of the stone and revives Hansel and Gretel. The king tells his queen what has happened, and she is happy. But Hansel and Gretel hear it all. (Their father cut off their heads, and their mother was glad?) They decide to run away – duh! – and find some decent parents who won’t hurt them. Have you read the original versions of fairy tales, not the Disney versions? In the Grimms’ “Cinderella,” for example, the stepsisters cut off parts of their feet to fit into the shoe. And at the wedding, where the Prince finally marries Cinderella, the wicked stepsisters’ eyes are pecked out by pigeons. This book tells these stories the Grimm way. It’s gory, but there is humor in it. I didn’t find any of it scary or anything. But here’s a tip: tell your mom that this is a book of fairy tales or she may take the book away from you. Besides, you’ll be telling the truth, not lying! Adam Gidwitz wrote this captivating novel in such a way that young readers will be entranced until the very last word. And look out for the sequels: In a Glass Grimmly, and The Grimm Conclusion! Didn’t want to read this. Nope. Not a jot. Three reasons for that. First off, the title. I’ve said it about twenty times since reading it and every time I can’t quite get it right (derivations have included “Something Dark and Grimm”, “A Grimm Tale”, and “Something Grimm”). Second, the jacket of the hardcover edition of this book isn’t particularly new. Silhouettes against a blue background. Ho hum. Third, I couldn’t believe that I was dealing with yet ANOTHER middle grade novel adapting fairy tales in new ways. After a while the The Sisters Grimm / The Grimm Legacy titles out there begin to meld together. From The Goose Girl to Into the Wild to Sisters Red I sometimes feel as if I am a little tired of fairy tales. However, to her surprise, she writes, "Gidwitz’s debut is unlike anything I’ve ever encountered before." Hansel and Gretel wend their way through the landscapes and stolen plot-lines of several lesser-known Grimm tales, like "Faithful Johannes." (Children will not know most of them, and most parents won't either.) This book is fun, and dark. The narrator has kind of a Princess Bride thing going. He pokes, cajoles, goofs. The violence is unflinching, but only really offensive if you are a.) used to Disney's sanitized versions of things, and b.) bound and committed to keeping your children sheltered to that degree. As Bird writes, "The kids are fine with it. It's the parents who can't take it." I have no problem recommending this for ages 10+. Nice article ! I'm interested in reading it, especially if it uses the Grimm version. Thank you for the discovery !